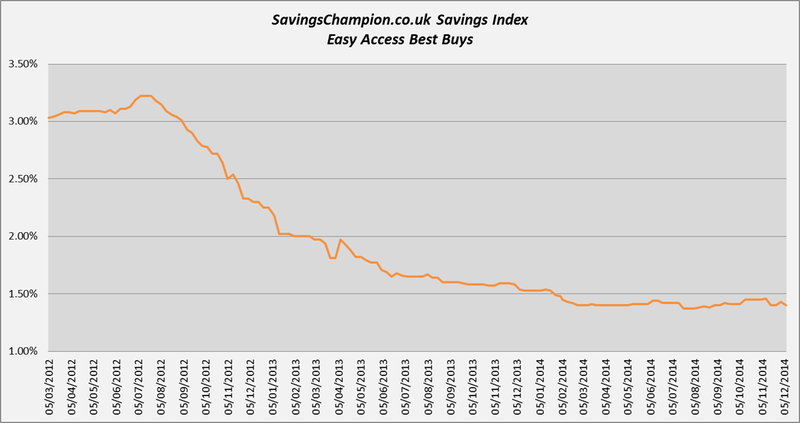 The SavingsChampion.co.uk Savings Index looks at the top 5 best buy easy access accounts. Overall it paints a pretty gloomy picture over the last few years, as rates came tumbling down, but at least there does seem to be a stabilising of the average rate over recent times. The recent improvement following ICICI Bank’s reappearance in the table has been negated by the withdrawal of Saga’s market leading rate. Shawbrook Bank has launched a new version of its 120 day notice account paying 1.85% gross/AER (the previous version was paying 1.75%). Following its replacement by Secure Trust Bank (1.81% AER) at the top of the Notice Account best buys; this new launch is the reaction that we were hoping for from Shawbrook Bank. It is exactly this type of competition that we need to see across the savings board to push rates back up in the right direction. Vanquis Bank has increased its 5 Year Fixed Rate Bond by 0.16% for new accounts opened, resulting in a rate of 2.96% gross/AER. An improvement, but not enough to challenge the current market leaders (Secure Trust 3.01% and Aldermore 3%). GE Capital Direct has launched a 2 year fixed rate bond paying 2.20% gross/AER, 2.18% monthly. Yorkshire Building Society (including Yorkshire, Barnsley, Chelsea and Norwich & Peterborough Building Societies) has launched a new 3 year fixed rate bond paying 2.40% gross/AER (the previous version was 2.30%). Whilst both of these new launches lag some way behind the current market leading rates from Punjab National Bank (2.30% and 2.55% respectively), they are competitive rates for those looking for a monthly interest option. Investec Bank launched a new 5 Year Step up Bond, which pays 2.80% for the first 3 years and 3.30% for the remaining 2 years, this averages out at 3% over the term. The average rate is lower than the previous version, but remains competitive in the current longer term bond market, sitting just below the current top rate from Secure Trust Bank (3.01%). On the less positive side, there have been some key withdrawals recently. SAGA has withdrawn its Internet Saver (Issue 16) paying 1.55% gross/AER, replaced with the Telephone Saver (Issue 16) paying a lower rate of 1.35% gross/AER. Unfortunately this was the market leading easy access account on the market and the replacement product sits below the current top rates of 1.40%. Kent Reliance has withdrawn its 1 and 2 year fixed rate bonds (1.90% and 2.20% gross/AER respectively) and replaced them with lower paying versions (1.75% and 2.05%). Both bonds had competitive rates and offered monthly interest options, Kent Reliance has taken itself out of the running with these significantly lower paying alternatives. Barclays Bank has withdrawn its best buy 2 year fixed rate ISA paying 2.02% tax free, replacing it with a new version paying 1.81% tax free. Again, one of the very best rates on the market for its type was replaced with a much less competitive version, which could be seen as another provider seeking to stem the flow of money in. The table shows the average rate for accounts available to open at the moment. When you look at the difference between these average rates and the best deals available, you can be sure that there are some low rates being offered on the market at the moment. The providers that offer these poor returns must be avoided at all costs! Our unbiased and hand-picked best buy tables offer alternatives and savers should vote with their feet, forcing uncompetitive providers to up their game. The only changes this week have been to the 3 and 5 year fixed rate bond averages, which have both gone up slightly. Whilst it is too early to read too much into this, it is at least in the right direction. 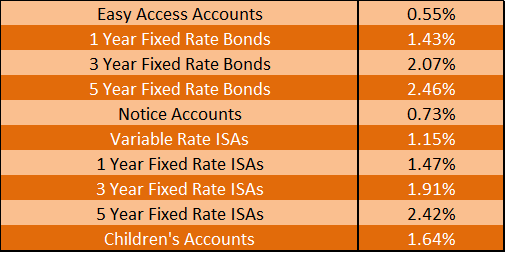 The table above shows how many savings accounts have seen rate cuts for existing account holders each month. As you can see, things really kicked off not long after Funding for Lending was introduced in August 2012 and has been continuing ever since. After a much higher number of cuts in October, November was a slightly quieter month for reductions. So far in December there haven’t been any cuts yet, although it is still early days. Interestingly, some announcements have already been made for January and February 2015, so those hoping for reprieve from the cuts next year may be disappointed.